Our current situation has caused me to think about our drive history, with a focus on mostly my participation and decisions. Do know that my current participation is as one of the combined team of TPAA and TAC volunteers. And as I near 80 (in a few years), I expect quietly to slip into silence and history. In 2011, then Principal Chris Simpson (soon to be District Superintendent) and I began the first ‘website’ scholarship drive: I would run the drive; he would collect the money. I explained my values were the result of my community college teaching experience of non-academic, job-oriented students. An early decision of having a school committee select the recipients remains very important. We raise the money; they select the graduates. With the introduction of the Tiger Pride Alumni Association, the selection process was reviewed by the TPAA directors with website members and school administrators with the result of the three criterion of students, (1) being in good academic standing and at least a “B” average; (2) having demonstrated the Core Expectations; and (3) that financial need is important but not the sole criterion. To see current students who are meeting the second one click here or on the image below. You will be moved to Principal LeCrone’s TAC articles. Now. We have proof that our process is helping students finance additional schooling. That said, as I personally 'am a work in progress' so is everything I administer. During our early years of the TAC drive, relatives of graduating ERHS seniors would write to me wishing to call attention to their relative and his/her superior record at ERHS and hoping I could get the grad a scholarship. That has not happened in years as I expect alumni and TAC members know how we operate. Of course, I explained the reason. 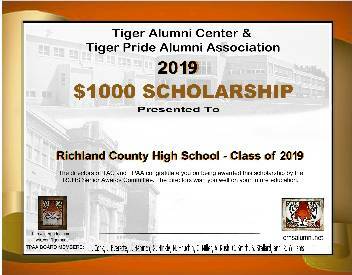 While we fund the scholarships given in our name, the recipients are selected by the Richland County High School Senior Awards Committee of the year. We have nothing to do with the selection process. We report to the principal the number of scholarships we can fund. He is our contact and no one else. We do not know who serves on the committee and never had a single conversation about the process with anyone who has. In time, the principal contacts the designated officer of Tiger Pride Alumni Association (TPAA) with the year’s list of the recipients. That is done so that we can prepare for the annual ceremony. For one thing we prepare an individualized scholarship certificate, a work of art, for each recipient. Years ago we worked out the selection criteria. During our early years we consulted others like the school principal about the process and defining selection points. We emailed the total TAC membership asking them for their opinions and many shared feelings and opinions. I personally consulted other alumni organizations. Before our first scholarship drive, I contacted the then principal (and now Superintendent) Chris Simpson. He welcomed my offer to fund scholarships with the checks going directly to him. We worked out the main criteria together. I explained that my last dozen years of twenty-seven years at Lincoln Land Community College in Springfield, Illinois, were spent teaching students in job-oriented certificate programs. Those experiences had led me to want to help such students graduating from my high school, from then ERHS and now RCHS. I wanted to help them start at a technical center or a community college. Another consideration was financial, it being that I knew I was not going to raise enough money to be able to offer scholarships at the funding level that the very top ERHS graduates would seek, for example, to help them attend major colleges, like University of Illinois. We got stated! From then, the 2012 scholarship, to the 2014 one, Principal Simpson and I work the scholarships as Tiger Alumni Center ones. With the creation of the Tiger Pride Alumni Association (TPAA) I knew that those directors would need to review the selection criteria and establish one that would satisfy their view as well as the current TAC members. With the guidance of ERHS administrators, from TAC members, and from my own research, we worked out the following criteria. For the Tiger Pride Alumni Association - TAC volunteers, the RCHS selection committee uses our developed criteria. 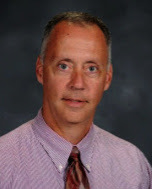 Principal LeCrone posts on TAC the monthly "Core Expectation" achievements of current students. Click here or on the image above to see some of those students. The list is below. 1) Students in good academic standing and at least a 'B' average. 2) Students that have demonstrated the Core Expectations of RCHS Students of Respect, Responsibility and Work Ethic. 3) Financial need of the student is considered in the selection, but it is not the sole criterion. Now with 91 recipients who have gone on to additional education, both at colleges and trade or technical centers we have good reason to be pleased with the above general process. The school committee has chosen recipients very well. I know as I do follow-up research of my own. Over and over, for example, I and other TPAA directors hear back from recipients on their progress toward their education or training. I also have read the Olney Daily Mail’s articles on the honor rolls of the OCC students – commonly the lists, like the “President’s” and the “Dean’s” include our past recipients. Having said all of the above, am I resting on our current success? Of course not! If you know me, if you’ve followed my blasts over these seven years, you know I wish we could do more. I’d like to fund more scholarship and with higher amounts. For example I’d like to fund the total expense of one semester. One reason for that is then the student would have a proven step into high education or technical center. Such could help him or her obtain more financial help. I’d like to help older RCHS alumni, such as those in their 20’s or 30’s who need help with career changes. As a community college teacher, I saw many youths in their late twenties, realize that they needed either more training or better one or new directions. The expense, however, was such that they had to work and had to manage a complex life with very little funds to pay for schooling. I also saw that in my own home with Barbara when she made the transition from that of an RN nurse to a hospital administrator. To do that she needed not one degree but two and so she started taking night and Saturday classes at the University of Illinois at its local campus. She worked hard for several years of in a super busy state, trying to pleased everyone -- trying to be a mother, wife, nurse, and student. Her key difference was that we could afford the expense. Many, many cannot and need help. I am just saying that I have lived that life and know the needs of many young Americans struggling to have something of the same life success as their parents. In short, I see needs that I would love for us to help, by funding those motivated in our community to seek a better life. They are not blood family members; they are part of our TAC – TPAA community. Each is one of us. Post Script -- Below I have copied some of the responses that Janet, our treasurer, gets from past recipients. Thank you so much for the $1000 scholarship you awarded me at Senior Award Night. The funds will help as I pursue a degree in Special/Elementary Education at Vincennes University. I sincerely appreciate this gift. Thank you again for the amazing scholarship! I would like to thank you for your generous $1000 scholarship. I am very happy and appreciative to be selected as the recipient of your scholarship. It is truly an honor to be a part of this. I am a nursing major student and I plan to become an Emergency Department Nurse either right here in Richland County or somewhere near here. I am planning to graduate in three years with my RN. Thanks to you, I am one step closer to that goal. By awarding me your scholarship, you have taken away some of the financial burden which will allow me to focus more on learning rather than how to pay for what I am learning. Once again, thank you for giving me this opportunity. I look forward to pursuing my dreams because of your generosity. Thank you for your generous contributions to the Class of 2018 furthering education. I truly appreciate the alumni’s efforts to raise money for scholarships to give to students like myself. I will be attending Wabash College in Mt. Carmel to obtain an associates degree in Agribusiness. The money from this scholarship will help pay for tuition, books and traveling expenses. I would like to take this opportunity to thank you for choosing me to be one of twenty students to receive a $1000 scholarship to any college of my choosing. This scholarship will help me greatly with paying for college and it is greatly appreciated. Again, thank you very much for selecting me for this award.